The SD1-S unit is a star/delta switch designed for use with three-phase star/delta motors. Speed change is approximately in the ratio of 1.3:1 and the power saving is up to 50%. The unit is a simple switch and does not provide any protection to the motor. As defined in the wiring code AS/NZS3000:2000, three-phase motors that are unattended must be suitably protected; HRC fuses are not sufficient for that purpose. 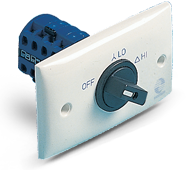 The unit incorporates an ON/OFF switch with high and low speed settings. The SD1-S switch is suitable for the entire range of three-phase star/delta external rotor motors used on the backward-curved centrifugal fan products supplied by Fantech. In addition it can be used with a range of star/delta motors fitted to axial flow fans.